John Neumann was born in what is now the Czech Republic. At an early age, he was attracted to the religious life and entered the seminary. Unable to be ordained in Bohemia due to a surplus of priests, John went to the United States where he was ordained in 1836. The next few years were spent in missionary work, primarily among German-speaking Catholics in upstate New York. In 1840, he joined the newly established branch of the Redemptorists in Pittsburgh and became the first Redemptorist to take his vows in the United States. John continued his missionary work in Maryland, Ohio, Pennsylvania, and Virginia, and in 1847, he was named superior of the American Redemptorists. In 1852, John Neumann was consecrated as the fourth bishop of Philadelphia. He now had an opportunity to make great inroads into what had become his passion: the education of poor German, French, Irish, and Indian Catholics. During his eight years as Bishop of Philadelphia, he reorganized the diocese, as well as opening eighty new churches and nearly one hundred schools. To staff these schools, John brought in many religious orders of priests and nuns. At the first national council of Catholic bishops, he helped to map out a plan of Catholic education for the whole United States. Although active in his support of education and busy with the duties of leading a diocese, John Neumann was never far from his people. By the time he became bishop, he spoke twelve languages and made it a point to address each of his people in their own language. At the time of his death, John was renowned for his holiness, charity, pastoral work, and his preaching. 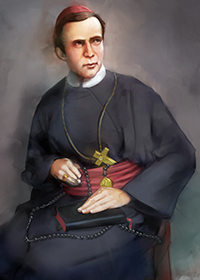 John Neumann was canonized in 1977 by Pope Paul VI, becoming the first American male saint and the first American bishop to be sainted. He is the patron of Catholic education. A memorial honors this saint on January 5th. John's message today: John Neumann’s goal was to have a school in every Catholic parish. This was very nearly realized by the middle of the twentieth century. While the numbers of schools has fallen in the years since, the need for educating our children in their faith remains as strong as ever. Consider how you could use your talents in the Faith Formation program in your parish. Could you teach a grade? Be a classroom helper? Coordinate instruction schedules?